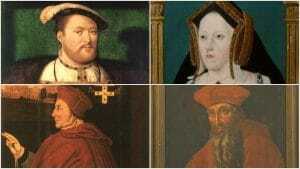 On this day in history, 21st June 1529, just over twenty years after their marriage, King Henry VIII and his first wife, Queen Catherine of Aragon, appeared before Cardinals Wolsey and Campeggio at the Legatine Court at Blackfriars. Cardinal Wolsey had been authorised by papal bull in April 1528 “to take cognisance of all matters concerning the King’s divorce” and Cardinal Lorenzo Campeggio had been made papal legate in June 1528 in preparation for hearing the divorce case. Proceedings began on 31st May 1529, after Catherine had refused Campeggio’s advice that she should join a convent, and it was on 21st June 1529 that Catherine caused a stir by making an impassioned speech. Also on this day in history 21 June 1553 – Edward VI chooses Lady Jane Grey as his heir. « Was Charles Brandon a womaniser? Katharine’s appeal to Henry is nothing short of heartbreaking. I’m surprised there wasn’t even more censure towards Henry and his relationship with Anne following Katharine’s speech. Right then and there when publicly Katherine swears to Henry before God and the Court Henry knows she came to him a virgin and pleads with him to comment. He says Nothing…..for this truth would have destroyed his argument and case for so called divorce. Karen Lindsey, in her book, “Divorced Beheaded Survived” talks about Henry and his poor judgment regarding virginity. At first, he thought Anne Boleyn was a virgin, then later claims she had a hundred lovers before and during their marriage. At first, he told Cromwell (or someone of that level) that Anne of Cleves was not a virgin, due to the quality of her breasts and belly, yet during the annulment proceedings, he said Anne of Cleves was still a virgin, since he had not taken her maidenhead. He thought Kathryn Howard was a virgin, even though she was not. So it comes as no shock, considering Henry’s later marital experiences, that he would definitely not have known that Katharine of Aragon was when they married. Oh, I’ve rather seen this as a piece pure theatre on Katharine’s part because how on earth could Henry claim to be a knight, a chivalrous man of honour, if he had called her on this one. If he had responded, “But Madam, I know no such thing.” that would have been devastating to her and her public reputation, at home and abroad. Perhaps I’ve totally misread this? The good faith exception is an interesting one, but it was more complex than you think. The two parties would have to be unaware that the marriage was invalid and were one party knew that the marriage had been made while an impediment existed, but the other did not, then the good faith exception could be used. The marriage could be examined and made good, by the proviso, let the church provide or the marriage could be declared invalid while protecting the legitimacy of the children. Katherine was advised to do the former, but it was doubtful that the argument would prevail. This was one reason to appeal to Rome, the court in England was biased against her. The reason that Henry did not seek to use this is that he hoped for a setting aside of the original dispensation. The use of this proviso may not actually have been granted in Henrys case as Henry Viii knew that he was taking on a no no by marrying Katherine in the first place. Yes he did not come to the conclusion that his marriage was cursed for many years later, claiming that after so many tragic loss of their children, that his marriage to Katherine was not lawful, but he did act only when he knew that Katherine could have no more children. The Bible spoke to him as he came upon Leviticus, although it was more likely that he introduced to the text by Wolsey. The annulment was a separate isdue to the legitimacy of any children and not the later was not raised here. The issue of Marys legitimacy would have to be decided by a Church court and the decision taken by Parliament. The decision at this point had nothing to do with Henry, he was submitting his case to the court as Katherine was. The decision was taken out of his control when the whole thing moved to Rome. Unfortunately for both sides the decision was not forthcoming and Henry took matters into his own hands. The final decision was made by the court at Dunstable but the decision that followed from Rome voted for Katherine. Henry did not declare Mary illegitimate until the Parliament of July 1536 when he declared Elizabeth this also. It could be argued that had he wished at this point, when he now changed English law to sort out his own created domestic mess that he could have used this good faith exception, but it was considered by Henry to be a fact that the children of his two early marriages were a threat to the legitimacy of his new marriage to Jane Seymour. For this reason Henry, even though it would leave him with no heir before Jane had a son, a dangerous gamble, could not in his own conscience use such a clause. The marriage to both Katherine and Anne Boleyn had been declared null and void, so in Henrys world legally his children were illegitimate by Act of Parliament. The clause may not have been granted any way, had his marriage been declared void by Rome, but English law and Parliament could have granted this. The clause was complex and not automatically granted. For more information on this you can read the entire argument of the legal complexity of this clause in Peter Hammond Richard iii Law Crown People in relation to the marriage of Edward iv and Elizabeth Woodville were the clause is examined in two long chapters on the legitimacy of their sons. The clause has been applied in the past and professor Hammond gives a number of examples as well as looking forward to if it could be used in this case. He is an expert in canon law and he concluded that the clause may not have been granted. It was said at the trial that she stared straight at him but he wouldn’t meet her eyes, Henry must have squirmed in his seat at Katherine’s outburst, and it took him completely by surprise so that he did not know how to react or what to say, by doing so I believe she won the sympathy of all the women in the country, because all married women could empathise with her over the horror of losing their husband to another woman, and then she rose and walked straight out of the court, it took courage to do that, one nil to Katherine. This really was the speech of her life as Starkey calls this plea for compassion and the truth and justice from her husband and King as the head of justice in the land. Henry must have felt embarrassed by what Katherine said, declaring in public that she was a virgin and that Henry knew this to be true. Katherine directly challenged Henry via his favourite brain part, his conscience as to the truth of what she said. He could only stand there in silence and take it; he could not say yes as this would destroy his case and he could not say no as this would call Katherine a lair. This he appears not to have been prepared to do at this stage; the evidence would be presented later; that was up to his counsel questioning the witnesses. In fact this entire trial must have been embarrassing as here were the King and Queen airing their personal life and sexual problems/differences in public. Katherine was fighting for her life, her marriage, her daughter, her honour and her dignity. Katherine maintained all of these; all Henry could do was raise her and plead with her not to make this speech; then remain silent. Her next move was even better: her appeal to Rome closed the court down.